Context: Youth with autism spectrum disorder (ASD) demonstrates impairment in the ability to socially and emotionally relate to others that can limit participation in groups, interaction with peers, and building successful life relationships. Aims: The aim of this exploratory study was to examine the effects of a novel multimodal Mandala yoga program on social and emotional skills for youth with ASD. Subjects and Methods: Five males with ASD attended 1 h yoga sessions, twice a week for 4 weeks. Multimodal Mandala yoga comprised 26 circular partner/group poses, color and tracing sheets, rhythmic chanting, yoga cards, and games. Treatment and Research Institute for ASD Social Skills Assessment (TSSA) scores were collected before and after the eight yoga sessions. The Modified Facial Mood Scale (MFMS) was used to observe mood changes before and after each yoga class. Paired sample t-tests were conducted on TSSA and MFMS scores to compare social and emotional differences post the 4-week camp. Narrative field notes were documented after each of the eight yoga sessions. Results: A significant improvement from pre- to post-test was found in overall TSSA (t(4) = −5.744, P = 0.005) and on respondent to initiation (t(4) = −3.726, P = 0.020), initiating interaction (t(4) = −8.5, P = 0.039), and affective understanding and perspective taking subscales (t(4) = −5.171 P = 0.007). Youth's MFMS scores increased from 80% to 100% at the end of eight yoga sessions demonstrating a pleasant or positive mood. Thematic analysis of the narrative notes identified three key factors associated with the yoga experience: (a) enhanced mood and emotional expression, (b) increased empathy toward others, and (c) improved teamwork skills. Conclusion: This multimodal Mandala yoga training has implication for developing positive social and emotional skills for youth with ASD. Youth with autism spectrum disorder (ASD) experiences a constellation of problems in social interaction, coping with change, communication, and repetitive behaviors. Moreover, there is a large emphasis on social and emotional barriers with children with ASD. These symptoms are predominantly present during childhood and can range from very mild to very severe in all ethnic and socioeconomic groups. It is reported that 1 in 68 children are diagnosed with ASD in the United States. Since ASD prevalence has been steadily increasing over the past two decades, it is important to understand whether yoga practices can improve social and emotional barriers in children with ASD. Traditional yoga postures and breath work provide opportunities for youth with ASD to focus on self and body awareness, transition from one activity to another, and improve sensory motor skills. It has shown to be successful in address some of ASDs core symptoms such as attention behavior problems,,,,,,,, eye contact,,, and engagement with others,,,,, in the classroom,,,, and at home.,, Mandala style yoga, on the other hand, because of its circular design format and connective poses, offers the added component for group synchronized movements focusing on teamwork. Specifically, Mandala style yoga is done in a group circle where participants share poses together and make big geometrical designs. Thus, these added components of Mandala style yoga are above and beyond traditional yoga and functionally offer more opportunities that youth with ASD needs for successful life integration involving eye contact, touch, and shared expression. While most yoga programs share similar characteristics of improving these communication and social components in their practices through different patterns of movement, limited research has been done to understand if developing a group synchronized Mandala yoga program would be an appropriate protocol to improve children with ASDs social and emotional skills. Thus, the goal of this exploratory study was to examine the effects of a specifically designed multimodal Mandala yoga program on social and emotional skills of youth with ASD. Participants were 5, 8–13-year-old males with ASD recruited from a 4-week ASD summer camp. All names of participants were changed to protect their identity and confidentiality. Pseudonyms were used in the presentation of all the following information. The inclusion criteria were (1) the youth participated in the autism camp for 4 weeks, (2) they were able to follow instructions, and (3) they were willing to participate in yoga activities. Demographic data are presented in [Table 1]. After given a detailed description of the study, parents were asked to sign a consent form before their child's participation. This study was approved by the Institutional Review Board of the local University. Five recreation therapy graduate students (RTGSs) were trained by the primary yoga investigator (PI) to complete the two measurement instruments and narrative progress notes based on video recordings of all yoga sessions. Inter-rater reliability for the five RTGSs was high (>90%). Pre- and post-testing was done on the first and last day of the 4-week camp using the Treatment and Research Institute for ASD Social Skills Assessment (TSSA). After the pretest, youth participated in two 60 min of yoga treatment sessions per week for 4 weeks. Observed changes in mood were also documented before and after each session by the participant's college buddy (i.e., an assigned partner who guided youth throughout the entire day at camp) and RTGS utilizing a Modified Facial Mood Scale (MFMS)., Finally, the RTGS summarized their assigned participant's overall physical, cognitive, social/communication, and behavioral/emotional performance after each yoga session in the form of a comprehensive progress note. A multimodal Mandala yoga program called Teen Yoga Warriors (TYWs) was used as a part of a 4-week camp for youth with ASD twice a week, for 1 h. All the youths had a college buddy and an RTGS observer assigned to them throughout the yoga classes. The college buddy's role was to assist the youth with behavior and yoga poses. The college buddies were instructed to let each participant attempt the pose first and followed by a verbal prompt to achieve a more accurate pose, and then physical assistance if warranted. The RTGSs role was to model poses, video record the session, document observations, and transcribe the observational data. TYW was designed by the PI, who is a 200 h Integrative Yoga Therapist, Certified Lakshmi Voelker Chair Yoga Teacher, a Level One YogaFit Kids instructor, and a Certified Therapeutic Recreation Specialist (CTRS). The PI trained and supervised the five RTGS to lead five separate sections of the TYW class: (a) 15 min warm-up: pose tracing sheet Getting Ready folder, breath work, and rhythmic chanting, (b) 15 min yoga pose flow series, (c) 5 min balance series, (d) 15 min Mandala group poses, and (e) 10 min heavy pressure relaxation and affirmation. The multimodal aspect of the TYW included kinaesthetic touch with partners (i.e., a method to escalate the sensitivity of touch with another person to break away from the barriers of sensory defensiveness by having participants connect physically to one another in group/partner poses), rhythmic gestures with chanting (i.e., a call and response format with hand movements such as clapping and patting), positive affirmation (i.e., oral statements in the present tense of a desired attribute example: “I am powerful”), whale breath work accompanied by straw and bead (i.e., breathing technique where the participant blows a bead up in the air through a flexible straw and attempts to land bead back on tip of straw in a controlled manner), fine motor enhanced yoga pose tracing sheets and Mandala art color sheets in personalized folders (i.e., a folder consisting of hash-mark stick figure drawings of each pose to trace and a separate Mandala coloring page), songs (i.e., singing familiar child gesture songs to reinforce time in pose, transition from one pose to another, and language enrichment), heavy pressure relaxation (i.e., a technique of deep even pressure over large portion of body used to manage sensory difficulties that helps the child to increase attention span and decrease defensiveness or modulate arousal); and teambuilding with cooperative circular Mandala yoga poses (e.g., seated in a circle while holding hands with legs raised in center in group flower pose). TYW emphasized yoga poses done in a circle to balance both the creative and rational hemispheres of the brain and focus attention. The circle format of the yoga mats represented wholeness as a group promoting a sangha or yoga community. TYW was uniquely designed to promote harmony and social skill development among youth with ASD. The TYW 1 h yoga routine involved 26 Mandala style yoga poses. The yoga class began with each participant entering the yoga room where they were given a Getting Ready folder with their name that contained the MFMS, one yoga pose stick figure tracing sheet (different pose series each week), and a Mandala color sheet (different design each week). In addition, TYW was done in 4–5 separate circles consisting of 6–8 yoga mats positioned around a central hulahoop. Each class consisted of the following series: 2 min readiness with feeling identification; 5 min of yoga stick figure tracing sheet work (or on large wipe board), 5 min breath work and super-brain, 5-min Kirtan Kriya chanting touch rhythmic clapping, 15 min weekly rotation of new pose flow series (sun salutation, warrior series, cardio series, and yoga deck card series), 5 min balance training (two new poses each week), 15 min Mandala group pose series (four different connecting synchronized movement poses series comprised of six new poses each week), 3 min final relaxation (sushi roll pose), 2-min gesture repetition positive affirmations, and ending with 3-min Mandala design coloring. 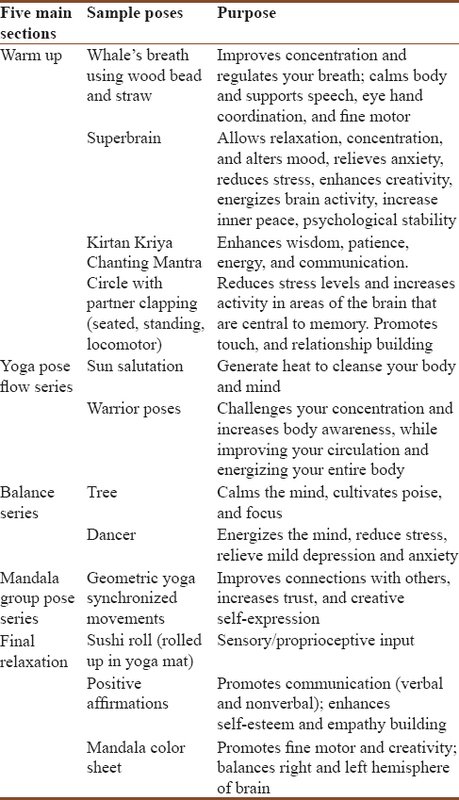 A sample guide to the TYW yoga series and purpose is shown in [Table 2]. The TSSA subsection on social skills contains a four-point Likert-type scale ranging from 0 (not very well) to 4 (very well). The RTGS observer indicated how well each participant did for the following four subsections: (1) maintaining interactions in five areas (e.g., cooperation, eye contact, and tone of voice), (2) responding to initiations in four areas (e.g., responding to a friendly greeting, accepting invitation, and answering questions), (3) initiating interactions in six areas (e.g., inviting others to engage, asking for help, and starting conversation), and (4) affective understanding/perspective taking in nine areas (e.g., understanding body language, basic or complex emotions, and putting yourself in someone else's shoes). A total of 24 social skill areas were graded with a possible score range from 0 to 96. A total score of 0 represents no social skills observed, a score of 1–24 indicates unsatisfactory social skills, a score between 25 and 48 acceptable social skills, 49–72 is appropriate social skills, and a score in 73–96 suggests effective social skills. MFMS was used to assess the youth's facial emotional mood., It includes an eight emotion scale: 1 = bored, 2 = sad, 3 = shy, 4 = frustrated, 5 = content, 6 = proud, 7 = happy, and 8 = excited. An example image of each mood accompanied by brief single-word descriptions and a number from 1 to 8 was displayed on a one-page sheet. The participants were asked to select the picture and/or word that best described how they were feeling at the beginning and end of each yoga class. Their college buddy would then record the youth's response on the corresponding mood scale score sheet, along with their observation of the youth's mood, and later the RTGS would record the youth's observed mood score through video tape. Each of the eight emotions on the score sheet was labelled from 1 to 8 for data analysis. For interpretation purposes, a score between 1 and 4 means unpleasant or negative mood, a score of 5–6 indicates pleasant or positive, and a score of 7–8 suggests active pleasure in engagement. Narrative notes are commonly used by a CTRS to record a participant/patients response to interventions and contain subjective and objective information. The RTGS who were assigned to each participant wrote a comprehensive narrative progress note to summarize the participant's overall performance during each yoga class based on the video recordings on physical, cognitive, social/communication, and behavior/emotional level of function. Descriptive data were used to describe the youth (M = 10.4 years) with ASDs TSSA performance. Paired sample t-tests were conducted on TSSA total scores to compare social skill of youth before and after the eight yoga sessions. Shapiro–Wilk normality test was recommended as one of the best choices for testing the normality and for small sample size data. Therefore, it was used to test the normality of data in this study and found that our sample distribution was normal. The four TSSA subscales related to interactions (e.g., maintaining, responding initiating, and affective understanding/perspective taking) were also compared to assess youth's social skills in each area. Results were considered statistically significant at P < 0.05. The MFMS scores from before and after each session were reported by the participant, college buddy, and RTGS. The scores were entered into a spread sheet as follows: 1 = bored, 2 = sad, 3 = shy, frustrated, 4 = frustrated, 5 = content, 6 = proud, 7 = happy, 8 = excited, and N/A = missing data. The qualitative data analysis was captured from the narrative progress notes and focused on identifying and interpreting the outcomes of TYW intervention. All five RTGSs were instructed to document using the form of a narrative note, the outcomes of each session providing both objective and meaningful subjective quotes in relation to the participants' level of cognitive, physical, social, and emotional/behavioral function. The 36 completed narrative notes were imported by a RTGS into a spreadsheet and each response was placed in a separate column, organized under the five areas of function. The analysis proceeded in several steps using a constant comparison method to generate initial codes and refine the codes to interpret the themes emerging from the data and ensure rigor. First coding was conducted by the PI independently on two separate occasions reading and rereading all five participants' 36 narrative notes to form initial analytical hunches about categorizing the data that had relevance to the yoga experience. Each time preliminary ideas were identified and placed into categories according to the five main areas of function from the narrative notes. The second coding attempt was done on a separate document without reviewing the first coding session. Next, the PI compared and contrasted the two separately coded narrative note summary documents by adding or merging codes as needed to capture the essence of the data. This approach resulted in an additional reorganization of the 15 initial codes with the 13 codes from the second PI coding session. These named codes were merged to form six themes that resulted in three main themes. The PI and the lead RTGS provided peer review of identified main three themes to confirm, disaffirm, or renew the final themes to establish rigor. Methodological triangulation was achieved through the use of multiple data sources (TSSA results, narrative notes, and coding chart), to test for consistency in the findings. The depth of triangulated data revealed the complexity of participant's yoga experiences, brought plausibility to essential themes, and established the authenticity of findings. This authenticity was further supported through data saturation whereby repetition of information and confirmation of previously collected data across residents occurred. Finally, themes were supported by the words and actions of participants. Consistent with qualitative methods of reporting researcher relationship to data, the PI possessed 31 years as a CTRS, 20-year experience working with ASD, and 3 years utilizing yoga for children with ASD. The five RTGS had 18 months of related course work and one semester working with children with ASD. Descriptive statistics showed that 60% of the youth with ASD categorized as acceptable social skills and 40% were in the appropriate social skills on TSSA before the yoga trainings. However, after the training, 80% of youth were classified into the appropriate social skills category and 20% at the effective level. A paired sample t-test was calculated to compare the pretest TSSA total scores to the post-test scores. The mean on the pretest was 49.8 (standard deviation [SD] = 12.63) and the mean of the posttest was 64.4 (SD = 13.42). A significant increase from pre- to post-test was found in TSSA (t(4) = −5.744, P = 0.005) indicating social skills of the sample were improved after Mandela yoga intervention [Figure 1]. The paired sample t-tests were also used to assess four TSSA subscales. 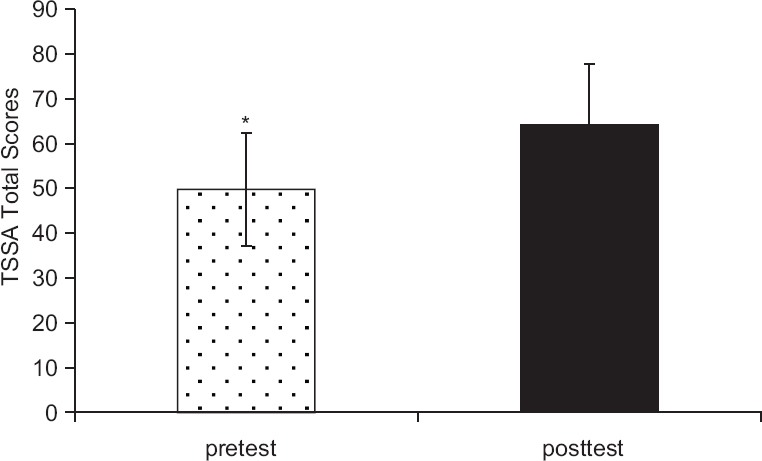 A significant increase was found from pre- to post-test on response to initiation (t(4) = −3.726, P = 0.020), initiating interaction (t(4) = −8.5, P = 0.039), and affective understanding and perspective taking (t(4) = −5.171 P = 0.007). These results suggested that youth with ASD benefited from using yoga training in three social skill performance areas related to developing positive relationships with others [Figure 2]. Descriptive statistics on the MFMS indicated that 80% youth with ASD were in the pleasant or positive mood before the yoga training. Their mood improved and all participants were classified as pleasant or positive mood after the training sessions. A paired sample t-test was used to analyze the effect of yoga program before and after the training on mood variables such as self, college buddy, and RTGS. No significant findings were found on self, t(4) =0.655, P = 0.548; on college buddy, t(4) = 0.592, P = 0.586; and RTGS, t(4) = −1.559, P = 0.194. Thematic analysis of youth with ASDs' narrative notes identified three key factors associated with the Mandala yoga experience: (a) enhanced mood and emotional expression, (b) increased empathy towards others, and (c) improved teamwork skills. Xavier and Alan displayed positive sportsmanship by giving their respective buddies a high five during chanting series. Harry also showed changes in willingness to engage with peers as he “high fived” and smiled on two occasions after completing a pose with his partner. He also began to clap hands in the Mandala circle with peers during opening chant while allowing his buddy into his personal space. A RTGS recorded in the last yoga session that “Harry was very respectful of others in his group.” In addition, Aaron and Steve would hold up their hands to be clapped by peers during chanting in cooperation with their Mandala teammates. Patrick displayed a leadership role by helping others in his group learn the different poses. He would step into the middle of the circle and model poses for his group while encouraging them to give it a try. This study explored the effects of a novel TYW which combined a variety of unique opportunities for touch, cooperation, creativity, rhythmic movement, and language enrichment for five male youths with ASD. The results indicated that a significant overall increase in social skills was found including on the subscales for response to initiation, initiating interaction, and affective understanding and perspective taking. In addition, there was a trend for improvement in positive mood state post yoga. The three main themes captured from the narrative notes displayed corresponding findings: (a) enhanced mood and emotional expression, (b) increased empathy towards others, and (c) improved teamwork skills. There was a trend for improvement in emotional expression and positive mood as seen by the MFMS and the narrative notes. Several changes occurred throughout the study with regard to shift in emotional expression and positive mood. For example, Harry and Peter both improved their attitude and enjoyment as they mastered whale's breath, going from a flat to happy affect and energetic moods. During week 4 following the pose, Harry stated, “I am not cranky anymore.” During down dog, Harry would wag his tail and bark when in a happy. Peter exhibited joy and self-confidence emerging as a leader of yoga poses during week 4, as he began to master balance poses and demonstrate them for the group. Alan displayed a shift from frustration in learning poses to curiosity. He went from lethargic and bored to more interested and content. He even announced to the group that the sushi roll was the “Alan Special!” Previous studies by Kenny, Behar, and Rosenblatt et al. have reported that including music, movement, games, songs, relaxation and noted improvement in happiness, emotional expression, and depressive symptoms, respectively. A hallmark feature for youth with ASD is the lack of emotional reciprocity. Results of this study demonstrated a significant change for all five males in affective understanding and the perspective taking subscale of the TSSA. They improved their recognition of facial expression, body language, and understanding emotions of others. Harry and Peter showed the largest gains of 5 and 6 points, respectively. Qualitative findings also revealed a similar theme of increased empathy for others. For example, Peter would ask his college buddy if others in his Mandala circle were okay if they were not participating. Even though Peter tended to get frustrated if the peers in his Mandala circle did not engage with group or partner poses, he would show concern for others by encouraging them to hold hands. He told his friend “good job.” Our findings are consistent with Radhakrishna et al. that children with ASD may improve their ability to trust, share, initiate, and reciprocate. One of the biggest obstacles faced by youth with ASD is the ability to establish and maintain relationships due to impairment in social interaction. Developing successful relations play a key role in being a part of a team. TYW incorporated opportunities for teambuilding targeting social skill development through emphasis on body and self-awareness with regard to spatial relations with peers. Similar approaches in yoga such as Creative Relaxation and Integrated Movement Yoga Therapy have demonstrated that specifically designed yoga for ASD can enhance self-awareness and opportunities for interaction with peers. The circular Mandala teambuilding group design used in this study served to enhance opportunities for increased human connectedness in social situations. This provided the building blocks for social cohesiveness that could potentially affect youth with ASDs real life situations such as developing friendship in school, forming a relationship with family members at home, and creating the aptitude necessary to function in the society. Significant improvement in the initiation of interaction with others for all five males rose from 2 to 12 points on the TSSA subscale that also contributes to team building skills. For example, Peter began to initiate holding hands with peers on both sides during the Kirtan Kriya chant and eventually went on to lead his group in changing directions as they progressed to the locomotor phase. Not only did the complexity of the yoga series increase throughout the chant phase but also the ability of the participants to socially adjust to the higher demand of the situation. Goldberg's research also confirmed that youth with ASD can increase their ability to do complex poses in a yoga program that included music, play, stories, and relaxation. By week 4, Harry began to verbally control his voice volume when asking his college buddy to help him get ready for sushi roll during final relaxation as opposed to very loudly demanding “sushi roll time!” These results are in concert with Radhakrishna et al., who found that children with ASD even greeted the therapist with a smile, vocalizing “Namaste” after 2 years of yoga. These aspects of social adjustment during yoga have been viewed by Deorari and Bhardwaj as essential to help a child with ASD become a better contributor to self, family, and society. The overall complexity of social interaction among peers reflects the ability to react and respond in a positive manner to sustain relationships with others. The males in this study showed a positive change in individual scores for response to initiation, ranging between 4 and 5 points. Four of the five participants changed in their response to initiation as their willingness to accept their college buddy's invitation to join in Kirtan Kriya rhythmic chanting circle. For instance, in week 1 of TYW, they were either disengaged or inappropriately engaged in attention-seeking behavior and they were able to clap hands with their peers in a circle along with the rhythm of the chant in week 4. Furthermore, it was reported that Harry showed changes in willingness to engage with peers as he “high fived” and smiled on two occasions after completing a pose together. He also began to clap hands in the Mandala circle with peers during opening chant as well as allowing his buddy into his personal space. In similar findings by Kenny and Radhakrishna et al. also showed that children with ASD increased social skills related to spatial relationships with peers through engagement in integrated yoga therapy programs. Although the results of this study are encouraging, limitations must be noted. This study was of a short duration with a small convenient sample, so it is unclear whether our findings on improvements in social and emotional skills can be generalized in the population. The results contribute to the literature by expanding on the knowledge of the various styles of yoga and approaches that can be used to meet the social and emotional needs for youth with ASD. Our findings provide preliminary evidence that a Mandala yoga program can foster social and emotional growth and development for male youth with ASD. It may also impact their family, community, and academic engagement. Further studies of a multimodal Mandala synchronized group yoga among a larger number of youth with ASD, with a variety of outcome measures, and longer treatment protocols would fulfill a stated need to provide complementary and alternative interventions to treat the rising number of children diagnosed with ASD. We would like to thank Texas State University Autism Summer Camp for equipment such as the yoga mats, yoga cards, yoga folders color, and tracing sheets. We would also like to thank all the children and their family for participating in the study. This study was financially supported by Texas State University Autism Summer Camp. American Psychiatric Association. Diagnostic and Statistical Manual of Mental Disorders. Text revision (DSM-V. 5th ed. Washington (DC): American Psychiatric Publishing; 2013. Centers for Disease Control and Prevention. Autism Spectrum Disorder Data and Statistics. Available from: https://www.cdc.gov/ncbddd/autism/data.html. [Last accessed on 2017 Apr 21]. Behar M. Yoga therapy for autistic children.2006. Retrieved from http://www.peacefulpathwaysyoga.com/pdfs/Yoga-Therapyfor- Autistic-Children-by-Miriam-Behar.pdf. [Last accessed on 2017 Apr 21]. Heasley S. Yoga May Improve Behavior in Kids with Autism. Available from: http://www.disabiityscoop.com/2012/10/15/yoga-improve-autism/16647/. [Last accessed on 2017 Apr 21]. Koenig KP, Buckley-Reen A, Garg S. Efficacy of the Get Ready to Learn yoga program among children with autism spectrum disorders: A pretest-posttest control group design. Am J Occup Ther 2012;66:538-46. Koterba R. Superbrain yoga in children with autism and ADHD. Winter: Prana World; 2007. p. 14-7. Peck HL, Kehle TJ, Bray MA, Theodore LA. Yoga as an intervention for children with attention problems. Sch Psych Rev 2005;34:415-24. Porter J. Yoga as an effective behavioral intervention for children diagnosed with autism spectrum disorder. Grad Annu 2013;9:25-30. Scroggins ML, Litchke LG, Liu T. Effects of multisensory yoga on behavior in a male child with Apert and Asperger syndrome. Int J Yoga 2016;9:81-4. See CM. The use of music and movement therapy to modify behavior of children with autism. J Soc Sci Hum 2012;20:1105-16. Goldberg L. Creative relaxation SM: A yoga-based program for regular and exceptional student education. Int J Yoga Ther 2004;14:68-78. Kenny M. Integrated movement therapy: Yoga-based therapy as a viable and effective intervention for autism spectrum and related disorders. Int J Yoga Ther 2002;12:71-9. Radhakrishna S. Application of integrated yoga therapy to increase imitation skills in children with autism spectrum disorder. Int J Yoga 2010;3:26-30. Radhakrishna S, Nagarathna R, Nagendra HR. Integrated approach to yoga therapy and autism spectrum disorders. J Ayurveda Integr Med 2010;1:120-4. Ehleringer J. Yoga for children on the autism spectrum. Int J Yoga Ther 2010;20:131-9. Stone W, Ruble L, Coonrod E, Hepburn S, Pennington M, Burnette C, et al. Treatment and research institute for autism spectrum disorders social skills assessment manual. Nashville (TN): Vanderbilt Kennedy Center; 2010. Khalsa SB, Hickey-Schultz L, Cohen D, Steiner N, Cope S. Evaluation of the mental health benefits of yoga in a secondary school: A preliminary randomized controlled trial. J Behav Health Serv Res 2012;39:80-90. Cheng M. Ottowa mood scales. Available from: http://www.drcheng.ca. [Last accessed on 2017 Apr 21]. Lincoln Y, Guba E. Naturalistic Inquiry. Beverly Hills (CA): Sage; 1985. Patton MQ. Qualitative Evaluation and Research Methods. 3rd ed. Thousand Oaks (CA): Sage; 2002. Rosenblatt LE, Gorantla S, Torres JA, Yarmush RS, Rao S, Park ER, et al. Relaxation response-based yoga improves functioning in young children with autism: A pilot study. J Altern Complement Med 2011;17:1029-35. Autism Speaks. What are the Symptoms of Autism? Available from: https://www.autismspeaks.org/what-autism/symptoms. [Last accessed on 2017 Apr 21]. Deorari M, Bhardwaj I. Effect of yogic intervention on autism spectrum disorder. Yoga Mimamsa 2014;46:381-4. Gwynette MF, Warren NJ, Warthen J, Trulsova JS, Ross CP, Snook CA. Yoga as an Intervention for Patients with Autism Spectrum Disorder: Review of the Evidence and Future Directions. Autism Open Access. Available from: http://www.dx.doi.org/10.4172/2165=7890.1000155. [Last accessed on 2017 Apr 21].